I live in a family that loves technology. Since my husband is a computer guy, we have a lot of nifty tech devices. As is often the case, my children know how to use these things so much better than I do! My five year old, in particular, thinks it's big fun when he's allowed to use "his" iPad. We've been trying to do some school work with him this year, but he's been resistant - particularly when it comes to handwriting. Does he sound like a typical boy, or what? 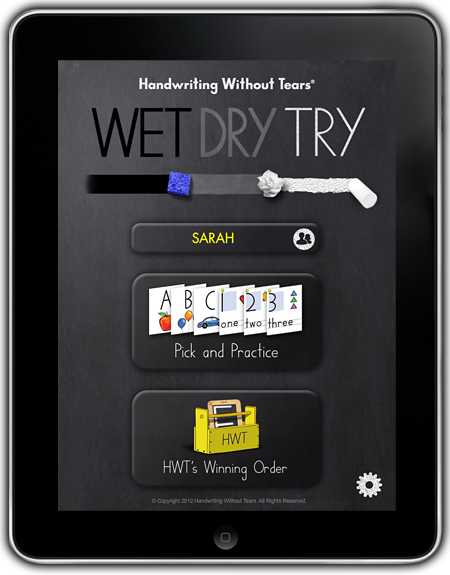 Enter the Wet- Dry-Try app, from the creators of Handwriting Without Tears handwriting curriculum! For the purpose of this review, I received a download code for the app for the iTunes store, regularly $4.99. It works with all versions of the iPad, even our old "first generation" one. The app is also available for Android devices from Google Play. It's aimed at Pre-K and kindergarten aged children, and could also be used with older children for remediation. There are two choices for how you'd like to use the app: "Pick and Practice," which allows you to choose whichever letter you'd like, and "HWT's Winning Order," following the order in the Handwriting Without Tears curriculum. There are three levels of difficulty for each letter. Once the student achieves 3 stars for a letter, they earn a "letter card." Children seem to like to collect cards, don't they? I know Isaac does! When he first started using the program, I thought it might be a little too sensitive to error. I watched him try to make a capital "B," for example, several times, unsuccessfully. However, he did learn to pay closer attention and be more careful, and eventually he got it right. It was good for him to have to work at it a bit. I read in the FAQ section on the website that "After testing, [they] landed on the degree of sensitivity that is most helpful in preparing children to write well." Look at that! They agreed with me. Oh, wait. Maybe that should be the other way around . . . I like that the personal instructor encourages the student. If they make an error, it says something like, "Let's give that another try." When you get it right, it says something like, "Great!" or "Cool beans!" It might sound a little silly to me, but Isaac responds well to the encouragement. Sometimes, Isaac's teacher forgets to be encouraging and might indulge in more frustrated sighing than is strictly necessary. Ahem. The Invisible Person In The App is very nice, all the time. Her voice is pleasant to hear, also. That's important. Isaac talks all. the. time. I don't know if I could listen to him chattering and handle a grating voice coming from an invisible person. This is a great app. Isaac enjoys it, and it teaches correct letter formation, which he needs to practice. He can't practice reversals or starting his letters in the wrong place with this app, like he can with pencil and paper. He argues far less with the Invisible Person than he does with me, and he doesn't seem to get frustrated at having to start over. I also love that he gets the practice of the chalkboard activity without using an actual chalkboard. Chalk is so messy, and as we do a lot of school on the couch, I much prefer the iPad option. I've been considering cutting back on "school" with Isaac to math and handwriting, and after using this app, Handwriting Without Tears is one of my top handwriting choices. Even if I don't end up purchasing the curriculum, the app is great for painless handwriting practice.